Here we go again....another week! I've been trying to think all week about this year of my life. I was twelve. I liked a boy named Ryan. He married my best friend Emma about 9 years later:) Lester, my cousin, and Laurie Jo were my other best friends. Lester was one of the smartest kids ever. But one day we were all at Laurie Jo's grandparents and we went down to the basement. There was a vintage "danger" sign hanging above the stairs, warning you not to hit your head on the ceiling. Lester says "dane - grr" I think Laurie and I laughed so hard we about peed our pants. We also sold the house that I had grown up in my whole life. We had to move to an old house that was on one of the farms that my dad owned. It was the most disgusting house that I had ever seen. I was mortified that we were going to have to live there. But not as mortified as I was when I found out that my younger sister, Charity and I were going to live with my grandparents while mom and dad fixed it up. Granted, we were only about three miles away from each other but my grandparents were old. Like in their 80's old. Turns out, that it wasn't that bad. We played a lot of SkipBo and Uno. Gramma and I were always partners and Charity and Grampa were always partners, and we were extremely competitive. I remember one game of Uno that Gramma was so excited that we won. But when we saw Grampa's card it was a zero! So it was like they won too! That was the year that the Spoon River that was next to our new house flooded. The flood of '93. We found a huge snapping turtle. Gramma was scared to death that we were going to get bit. I didn't realize the gravity of it until that turtle bent the end prong on the rake. The river flooded over the roads, filled my dad's fields, and wrecked a lot of things. In school, I was on the volleyball team. I loved volleyball and I was good at it. I was the captain of the JV team that year. I was also on the cheerleading squad. It wasn't nearly as fun as volleyball but it got me a free ride to all the boys basketball games. Seventh and eighth grade kind of run together on me for school. I can't remember what happened what year. Like, which year the Helders came to teach at school. They were two of my favorite people. 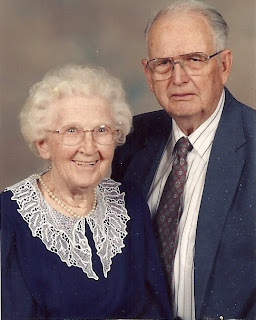 Edit: I did find a picture of my grandparents, Lyman and Wilhelmina Morey. So many endearing details! The snapping turtle, uno and skipbo (I played them too!) v-ball, a crush marrying a good friend – all so fun. Love your post. I am cracking up because I LOVED cheer-leading, I played volleyball but my coach told me I had to pick (thinking I would pick vball) well, I didn’t go back to another volleyball practice.